5.0 out of 5 stars Honestly, Fantastic., June 5, 2012 By Tim Tomic - Im from Sydney, Australia. I took a chance on this book and previewed it and liked what i saw. What i actually got was even better. The book guides you through each step of learning guitar step by step, and is easy to follow and lets you go at your own pace. The chapters build from one to another incorporating what you learnt in the previous and lets you progress naturally. The diagrams and text and easy to read and easy to understand. I am eagerly awaiting a follow up book and will definitely buy it if it gets released. Thanks heaps to the guys at NYC Guitar School! 5.0 out of 5 stars This is it!, May 25, 2012 By M. Oros - (REAL NAME) This is it! Daniel Emery has created an extremely accessible guitar teaching method with "Guitar for Absolute Beginners". The book is readable, humorous, encouraging and very practical. Most guitar beginner books give you some basic references and then ask you to start playing the guitar like this is the second string instrument that you are about to master. Mr. Emery does not do this, he really means absolute beginner and takes you forward in increments that are practical to learn at home. His encouragement coupled with his method allow you to make progress without great frustration. Mr. Emery's book is the perfect companion along with a good guitar teacher. While the book could stand on its own to get you started, being a guitar teacher, Mr. Emery has given your guitar teacher a position in the book to work with you on the technique and form that can only be achieved with someone watching you play and answering interactive questions during lessons. If other beginner guitar books have been frustrating to you like they have been for me, please give "Guitar for Absolute Beginners" a try. Mr. Emery, I am patiently waiting for the next book in this series or for you to open a guitar school in my neighborhood. Thank you for taking the time to remember what it was like to learn the guitar and share it with new enthusiasts. 5.0 out of 5 stars BEST GUITAR BOOK HANDS DOWN, April 19, 2012 By V. Burrows "Victoria B" - (REAL NAME) I own a variety of guitar books. Some are confusing, some offer little to no instruction, most talk more about music theory than practical guitar playing and guidance... and ALL are boring. I bought Guitar for Absolute Beginners as a last ditch effort to find a decent guitar book that offered me the basics along with practical advise, tips for better guitar playing, easy to follow instruction, and well maybe something that could inspire me!!! Tall order no doubt but this book not only offered all the above, the author managed to make me laugh and kept me entertained!!! I wanted to keep reading!!! A guitar book!!! Imagine!!! But my needs were quite large to fill: my husband and I haven't played guitar since childhood. My dad, who played amazing but by ear only taught me so I had no formal lessons and my husband had taken only a few. Our two daughters (ages 14 and 17) wanted to also begin guitar. They are true beginners, as they had never even held a guitar. So various ages, various levels, and yet this book has been fabulous for my whole family. I was really looking for something to guide me so I could start playing ASAP without plucking it out string by string learning notes for the next 6 months. My husband is more mechanically minded and enjoys learning some of the more technical stuff. This book provide both to us, just enough of the technical but plenty of practical advise so one can start playing their favorite songs ASAP. The author encourages this which is awesome since other books discourage playing any "real" songs until "good" habits have been ingrained. Overall a great book, looking forward to the next one. 5.0 out of 5 stars Breaks it down Barney style, August 20, 2012 By Dustin - Okay, so I don't live in New York City, nor am I going to spend the money to travel there and take the classes in person. However, this book, even by itself, is absolutely fantastic. It has taken me from playing single notes and bumbling around the fretboard to playing real, albeit easy, songs in a matter of a few weeks (about an hour each day practice)! It will teach you rhythm ("the most important job of a guitarist! "), the G-Em-C-D7, G-C-D-C, and the G-D-Am-C chord progressions (the chord progressions for literally thousands of popular songs), what a capo is, what it does, how to make a cheap one, and how to use it, the principles of strumming and strum patterns, and a basic foundation of music theory. This book is written in simple English, and features illustrations and diagrams that won't leave you wondering what they're referring to. In other words, it breaks it down Barney style. I wish I would have had this book a decade ago. Words can't describe how I feel about guitar and my desire for learning now. All of it thanks to "Guitar for Absolute Beginners." I really hope that Daniel Emery and the rest of the New York City Guitar School is working on the next book. 5.0 out of 5 stars Beginner Guitarist Must Have, November 18, 2010 By Kellee J (Chicago, Illinois USA) - (Need to change my profile city - I'm in NYC now!) 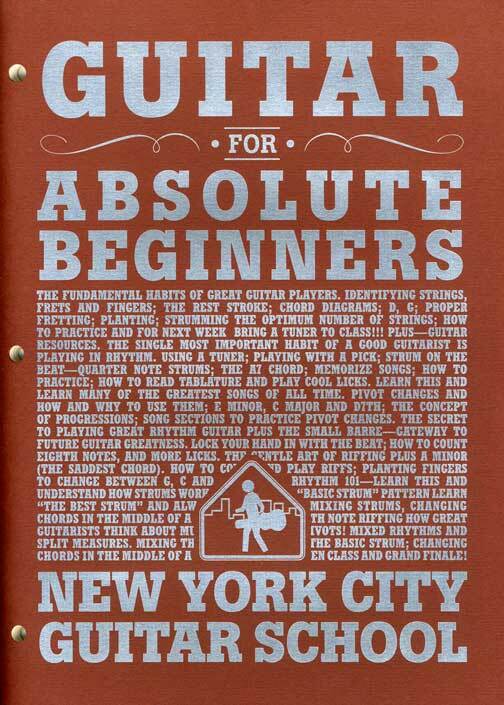 I got this book as part of the Absolute Beginners class at the NY Guitar School and I don't think I could have done so well in the class without it. One of my friends who has been playing the guitar for years, thumbed through it and said that he wished he had something like this when he first started -- then he thumbed through it again and said, "S#@%! There's stuff in here I could use now!" The book provides a natural progression of foundation guitar skills that's really intuitive plus there's helpful hints about practicing and what songs feature what strum patterns and chords. Even though I've moved on to a more advanced class and my skills are improving, I still go back and reference it regularly. 5.0 out of 5 stars Absolutely Fabulous, July 13, 2011 By Briana I have started to learn the guitar 3 times in my life during the past 12 years, the first two times i had terrible teachers and even worse learning materials and the third time was 6 months ago when I was given this book. And its official... I'm FINALLY a guitar player. After owning a guitar for more than a dozen years and never knowing more than 2 chords at any given time I am rocking out on a nightly basis at home and have begun the process of writing and composing my own music that has been stuck in my head for years - this book has brought so much to my life. It has given me the freedom to be bad and still look forward to getting better everyday. When every other manual has never been as encouraging, helpful, knowledgable, funny (yes the book is hillarious!) and an AMAZING teaching tool. I can not say enough good things about this book!!! For anyone who is lucky enough to take classes at NYCGS in NYC they know first hand how positive and supportive a learning environment it is there, but for anyone who can't get to the studio or afford group classes or privates this is seriously the next best and closest thing! Thanks Dan for making me not only a guitar player but for giving your gift of teaching easy methods & tricks to those of us who have a passion and a desire but have never had the right teacher ... until NOW! 5.0 out of 5 stars What more can I say but Superb, November 19, 2010 By English Guy in NY Ok, so I lied when I said the only thing I can say about it is 'Superb' but honestly it is such a good guide - beginning with knowing what a guitar is and does through to teaching you the basics to play countless songs. I was lucky enough to do this course with a teacher at the school but I gave this book to my girlfriend afterwards. Now there is no difference in my ability and hers! The only thing you need to do is to read it and practice, practice, practice! I can't wait till I'm back from working in Hong Kong to take more lessons or to get the next book that will pick up from where this takes you. To add further information to this story I have tried other books and had a guitar for 4 years till I found out about these people and this book! Oh and if Dan from NYC Guitar School reads this Please, please, please write the next one so we can get it! I hope you all enjoy yourselves learning and playing, I know I'm loving it right now. 5.0 out of 5 stars Excellent Purchase, February 29, 2012 By Bubba - See all my reviews I've wanted to play guitar for as long as I could remember and finally set out in 2012 to do it! Initially looking into "guitar for idiots" style books i was bummed to see everything seemed dated. Nothing was fresh or written in a way that truly related to what you go through. I read about NYC Guitar Schools Level I book and thought I'd give it a try. I could not have been happier. The way the book is written, to it's size, looks, etc is absolutely perfect in my opinion. The book although extremely informative/educational, is also funny as well. Dan truly understands and sympathizes with beginners and you can tell he is truly passionate about his work. Book is a must buy for beginners or even people trying to brush up. Enjoy! 5.0 out of 5 stars I agree, Best Guitar Book out there, May 30, 2012 By A Customer I am so glad I bought this book! It didn't have that many reviews at the time, but they were all 5 stars so I took a chance. Almost makes me wish I lived in NYC so I could take their classes. This book made playing the guitar so accessible, I had never played along with songs on the stereo before. Really helped me with making smooth chord changes. I've become a better guitar player thanks to this book. I would definitely buy any other books that come out by this author or guitar school. Highly, highly recommended.